The compost pit has been in use since our cave dwelling ancestors tidied up by burying the fish bones in a hole. They predate agriculture. 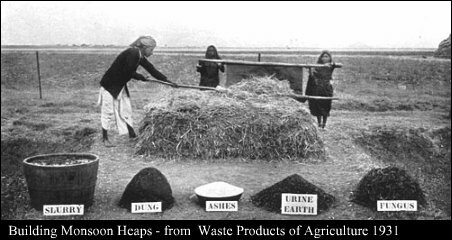 They are still in use today as one of many composting options. In dry climates, or even just during the dry season, a pit can really improve the compost process. This page was inspired by a question from Fiaz. Sir Albert Howard is considered the father of organic agriculture. He lived and worked at the time of the birth of chemical agriculture. While the new chemistry model of agriculture was exciting it was also expensive and more importantly untested. He was based in India from 1905 to 1939. He was committed to developing farming methods that the average Indian farmer would be able to afford and to use. 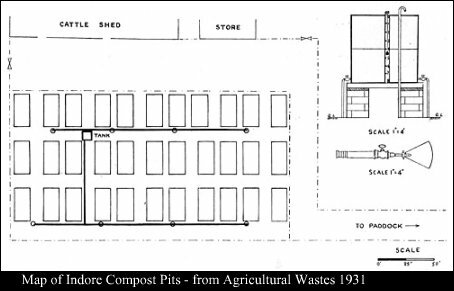 At the heart of his method was development of a pit system of composting. Not labour intensive and fit in with care of cattle. Have a good Carbon/Nitrogen ratio - his was about 33/1. Rapid and aerobic throughout with adequate water and the right fungi and bacteria at the right time in the process. No loss of Nitrogen - if possible a gain. Compost cured so it gets to the field right when ready. Clean, sanitary, odor and fly free. 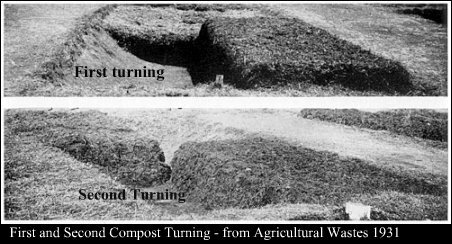 The secrets of a workable compost pit system are all revealed in a short publication called The Waste Products of Agriculture -- Their Utilization as Humus written by Albert Howard and Yeshwant D. Wad and published in 1931. "The compost factory (Plates IV) itself is a very simple arrangement. It consists of thirty-three pits, each 30 ft. by 14 ft. and 2 ft. deep with sloping sides, arranged in three rows with aufficient space between the lines of pits for the easy passage of loaded carts. The pits themselves are in pairs, with a space 12 ft. wide between each pair. This arrangement enables carts to be brought up to any particular pit." Let me emphasize that the compost pit used by Sir Howard is shallow - no more than two feet deep. The pits are filled to the top with a careful combination of farm waste vegetation, manure and what he calls urine soil. The urine soil, collected from the stables where the oxen are kept, is dried, ground and then mixed with water and sprinkled onto the material in the pile. About 14-16 days after the pit is filled the first turning occurs. Before turning compost from a pit that is a month old is mixed with water and sprinkled into a loosened top layer of the pit. The material is then divided in half lengthwise and the material from one side of the pit is piled on top of an undisturbed other side of the pit. At one month the material in the pit is again turned. This time the entire content of the pit is turned, moved and fluffed into the empty side of the pit. At two months the material in the pit is turned and moved out of the pit. "A rectangular heap is made on the ground alongside the pit or in the field, not more than 10 ft. broad at the base, 9 ft. wide at the top and 3.5 ft. high, the material being spaded and piled with watering as before." At three months the material can be applied to the fields. During the monsoon period the compost pits fill with water so compost had to made in compost heaps from mid June to the end of September.If you leave the compost in pits during the monsoon you will end up with anaerobic compost. "The dimensions of the heaps should not exceed 7 ft. by 7 ft. at the top, 8 ft. by 8 ft. at the bottom and 2 ft. in height. The dimensions of these monsoon heaps (any one of which is not necessarily completed by the amount of vegetable waste which can be accumulated in six days) must not be exceeded, otherwise aeration difficulties are certain to be encountered. The decomposition in heaps during the rains does not take place so evenly as in the pits." This link will take you to the Journey to Forever website, a great organization by the way, where you can read the full text of Waste Products of Agriculture and Chapter 4, The Manufacture of Compost by the Indore Method. An Introduction to Bokashi Composting - This page introduces Bokashi composting a method used extensively in Japan, Korea and other parts of Asia. The Haber Process - Haber developed his process of making synthetic nitrogen fertilizer around the time Sir Albert was busy in India.